Enhancing Trusted Cloud Computing Platform for Infrastructure as a Service, KIM, H.
A Current Mode Design of Fractional Order Universal Filter, SACU, I. E., ALCI, M.
Robust Fourier Watermarking for ID Images on Smart Card Plastic Supports, RIAD, R., HARBA, R., DOUZI, H., ROS, F., ELHAJJI, M.
Multi-Level Simulated Fault Injection for Data Dependent Reliability Analysis of RTL Circuit Descriptions, NIMARA, S., AMARICAI, A., BONCALO, O., POPA, M.
Speeding Up VM Image Distribution for Cloud Data Centers, LEE, C., LEE, H., KIM, E.
FANG, W. , LI, S. , LIANG, X. , LI, Z. This paper investigates a special class of wireless sensor networks that are different from traditional ones in that the sensor nodes in this class of networks are deployed along narrowly elongated geographical areas and form a long-strip topology. According to hardware capabilities of current sensor nodes, a cluster-based protocol for reliable and efficient data gathering in long-strip wireless sensor networks (LSWSN) is proposed. A well-distributed cluster-based architecture is first formed in the whole network through contention-based cluster head election. Cluster heads are responsible for coordination among the nodes within their clusters and aggregation of their sensory data, as well as transmission the data to the sink node on behalf of their own clusters. The intra-cluster coordination is based on the traditional TDMA schedule, in which the inter-cluster interference caused by the border nodes is solved by the multi-channel communication technique. The cluster reporting is based on the CSMA contention, in which a connected overlay network is formed by relay nodes to forward the data from the cluster heads through multi-hops to the sink node. The relay nodes are non-uniformly deployed to resolve the energy-hole problem which is extremely serious in the LSWSN. Extensive simulation results illuminate the distinguished performance of the proposed protocol. I. F. Akyildiz, W. Su, Y. Sankarasubramaniam, E. Cayirci, "A Survey on Sensor Networks", IEEE Communications Magazine, vol. 40, no. 8, pp. 102-114, Aug. 2002. Y. S. Li, M. T. Thai, W. L. Wu, Wireless Sensor Networks and Applications. Springer, 2008. C. W. Chen, Y. Wang, "Chain-Type Wireless Sensor Network for Monitoring Long Range Infrastructures: Architecture and Protocols", International Journal of Distributed Sensor Networks, vol. 4, no. 4, pp. 287-314, Oct. 2008. H. F. Li, F. Liu, Y. X. Hou, "Railway Hazardous Articles Monitoring System Based on Wireless Sensor Network", Proc. 2nd International Conference on Information Engineering and Computer Science (ICIECS), Wuhan, Dec. 2010, pp. 1-4. Y. J. Sun, X. Liu, W. Chen, M. Yu, "Chain-type Cluster Topology for Wireless Underground Sensor Networks", Journal of Computational Information Systems, vol. 7, no. 1, pp. 206-213, Jan. 2011. J. Lee, J. E. Kim, D. Kim, P. K. Chong, J. Kim, P. Jang, "RFMS: Real-time Flood Monitoring System with Wireless Sensor Networks", Proc. 5th IEEE International Conference on Mobile Ad Hoc and Sensor Systems (MASS), Atlanta, GA, Sep. 2008, pp. 527-528. A. 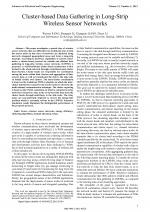 A. Abbasi, M. Younis, "A Survey on Clustering Algorithms for Wireless Sensor Networks", Computer Communications, vol. 30, no. 14-15, pp. 2826-2841, Oct. 2007. X. B. Wu, G. H. Chen, S. K. Das, "Avoiding Energy Holes in Wireless Sensor Networks with Nonuniform Node Distribution", IEEE Transactions on Parallel and Distributed Systems, vol. 19, no. 5, pp. 710-720, May. 2008. H. G. Gong, M. Liu, "A Two Level TDMA Scheduling Protocol with Intra-cluster Coverage for Large Scale Wireless Sensor Network", International Journal of Computer Science and Network Security, vol. 6, no. 2b, pp. 77-84, Feb. 2006. W. Heinzelman, A. Chandrakasan, H. Balakrishnan, "An Application-Specific Protocol Architecture for Wireless Microsensor Networks", IEEE Transactions on Wireless Communications, vol. 1, no. 4, pp. 660-670, Oct. 2002. O. Younis, S. Fahmy, "HEED: A Hybrid, Energy-Efficient Distributed Clustering Approach for Ad Hoc Sensor Networks", IEEE Transactions on Mobile Computing, vol. 3, no. 4, pp. 366-379, Oct. 2004. Y. Xu, J. Heidemann, D. Estrin, "Geography-Informed Energy Conservation for Ad Hoc Routing", Proc. 7th Annual International Conference on Mobile Computing and Networking (MobiCom), Rome, Italy, Jul. 2001, pp. 70-84. O. Younis, S. Fahmy, "An Experimental Study of Routing and Data Aggregation in Sensor Networks", Proc. International Workshop on Localized Communication and Topology Protocols for Ad Hoc Networks (LOCAN), Washington DC, Nov. 2005, pp. 50-57. W. W. Fang, D. P. Qian, T. S. Chu, Y. Liu, "A Reliable and Efficient Data Delivery Scheme for Clustered Wireless Sensor Networks", Journal of Xian Jiaotong University Nature Science, vol. 43, no. 8, pp. 28-33, Aug. 2009. F. M. Li, W. J. Xu, C. Gao, "A Power Control MAC Protocol for Wireless Sensor Networks", Journal of Software, vol. 18, no. 5, pp. 1080-1091, May. 2007. C. Sergiou, V. Vassiliou, "Energy Hole Prevention in Wireless Sensor Networks", Proc. 9th ACM/IEEE International Conference on Information Processing in Sensor Networks (IPSN), Stockholm, Sweden, Apr. 2010, pp. 398-399. X. Li, A. Nayak, I. Stojmenovic, "Sink Mobility in Wireless Sensor Networks", Wireless Sensor and Actuator Networks: Algorithms and Protocols for Scalable Coordination and Data Communication, Wiley, 2010. O. Gnawali, R. Fonseca, K. Jamieson, D. Moss, P. Levis, "Collection Tree Protocol", Proc. 7th ACM Conference on Embedded Networked Sensor Systems (SenSys), Berkely, CA, Nov. 2009, pp. 1-14. 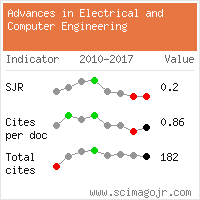 Citations for references updated on 2019-04-22 03:26 in 89 seconds. Website conception, design and maintenance by Eugen COCA. Content updated on 28 Feb 2019. Site engine updated on 28 Feb 2019. This page was generated on the server in 0.082 seconds and loaded in your browser in > seconds.